Fry the diced green bell pepper. Saute the onion and the garlic. Boil the tomatoes in a cup of water. Place the fried eggplants in one layer. 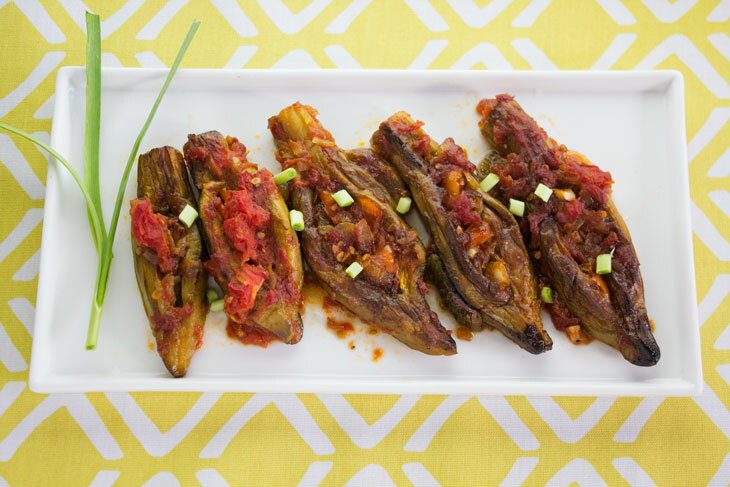 Score the belly of each eggplant with a knife. Fill the onion, garlic and peppers in the belly of each eggplant. Spread the tomato mixture on top. Cook for 30 mins or until the water evaporates. Imam Bayeldi literally means "the Imam fainted". There are many tales about why this dish is called that. In our family, we call it Bayildim which means "I love it". With Bayildim we always serve french fries, bell peppers, and fresh herbs usually rocket leaves.